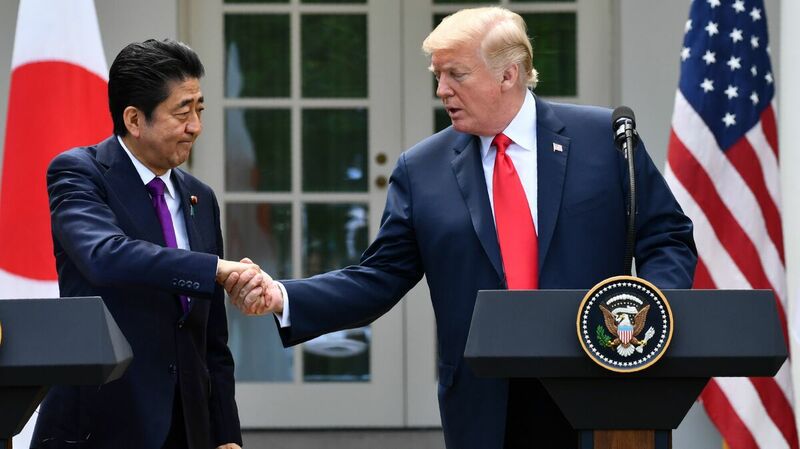 Trump Meets With Japan's Shinzo Abe Ahead Of Nuclear Talks With North Korea Joined by Japan's leader, President Trump held out the possibility of normalizing relations with North Korea, ending the war between North and South and inviting Kim Jong Un to the White House. President Trump shakes hands with Japanese Prime Minister Shinzo Abe during a joint press conference in the Rose Garden of the White House on Thursday. President Trump said Thursday that his summit meeting with North Korean leader Kim Jong Un next week could be "a great success," and held out the possibility of an unprecedented invitation to the White House for Kim if all goes well in Singapore. Trump spoke at a Rose Garden news conference after meeting with Japanese Prime Minister Shinzo Abe. While the president expressed optimism about the upcoming talks with Kim, Trump cautioned the summit could also be just a "modified success." And he said he would be prepared to "walk away" altogether if the talks prove to be unfruitful, reminding reporters "I did it once before." Trump said he had a list of over 300 "massive" sanctions to impose on North Korea, but said he's "decided to hold that until we can make a deal." He said his policy of "maximum pressure is absolutely in effect." But Trump said he has refrained from using the term "because we're going into a friendly negotiation." Trump generally emphasized the positive outcomes that could come from a successful meeting, including ending the state of war between North and South Korea, and normalizing relations between Pyongyang and Washington. At an Oval Office photo op with Abe earlier Thursday, Trump said he doesn't "have to prepare much" for his meeting with Kim. Trump said "I think I'm very well prepared," adding "it's about attitude. It's about willingness to get things done." Trump told reporters the nuclear summit in Singapore is "going to be much more than a photo op." He said "I think it's going to be a very fruitful meeting, I think it's going to be an exciting meeting." Thursday's White House meeting with Japan's prime minister was an opportunity for Abe to urge the American president not to relax his demands for the complete dismantling of Pyongyang's nuclear weapons. Japan, along with South Korea, is especially vulnerable to attack by North Korea. Some of Kim's recent missile tests have crossed into Japanese airspace. Abe wants assurances that Trump will address that threat in his talks with Kim, and not simply worry about longer-range missiles that have the capacity to strike the U.S.
Abe said Thursday that the U.N. Security Council resolution calling on North Korea to eliminate all its weapons of mass destruction and all ballistic missiles "must be implemented." Japan also wants Trump to press Kim on the fate of Japanese citizens who were kidnapped by North Korea. In the Rose Garden news conference, Abe said Trump "fully understands" Japans demand that Kim release at least a dozen Japanese citizens now being held in North Korea. Abe said Trump "is one of the leaders who understands the issue the most." Trump promised to do so when he and Abe met in Florida in April. Speaking to White House reporters later Thursday, Secretary of State Mike Pompeo said there have been "near daily briefings" of the president by Pompeo and others on his national security team regarding North Korea in the past few months. "I'm very confident," Pompeo said, "the president will be fully prepared when he meets his North Korean counterpart." Pompeo, who has met twice with Kim, said the North Korean leader indicated to him personally that he is prepared to denuclearize, that the current model doesn't work and that Kim is prepared to be "big and bold." Thursday's meeting between Trump and Abe seemed largely focused on the upcoming Singapore summit, but trade was discussed too. Japan was one of the first U.S. allies to be hit with tariffs on steel and aluminum exports to the U.S. The Trump administration has since broadened those tariffs to cover other allies including Canada, Mexico, and the European Union, as well as suppliers such as China and Russia. The administration is also weighing a 25 percent tariff on imported cars, which would be a big blow to Japan. Trump said Japan has agreed to buy "billions and billions of dollars of additional products of all kinds," specifically citing "military jets, airliners from Boeing" and "lots more farm products."